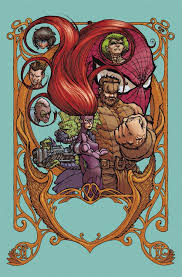 This second one-shot in a series of three comprising the “Inhuman Error” story picks up where the Amazing Spider-Man Special left off, with Spidey throwing in with the current Inhuman leader, Queen Medusa and her loyal subjects, the Inhuman citizens of New Attilan as they face a rebellious band of upstart Inhumans. This is the core conflict of series writer Jeff Loveness’ narrative and while it is billed as essentially an Inhumans story Loveness’ affinity for Spider-Man very often takes center stage. Although a relative new comer, Loveness has shown an extremely impressive ability to write a well-rounded and endearing Web-Slinger; his Spider-Man/Peter Parker is humorous without being infantile, witty without being simply sarcastic and perhaps most importantly, he is human in all things and as such he is fallible. To me that has always been the measure of a good Spider-Man scribe; one who gets that Peter may hide his identity but he still wears his heart right out there on his sleeve. 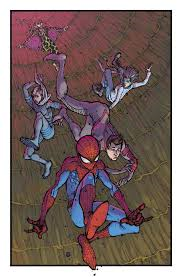 It would not surprise me at all to see Loveness on a monthly Spider-Man book and in no time flat to hear his name mentioned with such legendary Spider scribes like; DeFalco, Michelinie, Dematteis and Slott, he has that kind of talent. The chemistry between Spidey and the clutch of fledgling Inhumans he finds himself banded together with makes for some really witty banter. Loveness again shows his chops at writing humorous yet smart dialogue; there is a sense of comradery just beneath the surface of the good natured ribbing that calls to mind Bendis’ early Ultimate Spider-Man characters and that sort of Buffy/Scooby Gang paradigm that they all shared. The larger conflict between Medusa and the rarely used villain Red Raven is equally engrossing due in large part to Loveness’ compassionate handling of the villain; he fastidiously describes Red Raven’s origin and tragic past which greatly effects how we view his motives and though his actions may be considerably less than noble, they are nonetheless, understandable from a certain perspective. Red Raven benefits immensely from Loveness’ sympathetic re-telling of his origin from which he emerges a more compelling and dynamic character. The physical aspects of this conflict are brought to life by the brilliant artist Ryan Lee. His affinity for the macabre is obvious as his character designs echo the grotesqueries found in nightmares or inhabiting Dante’s Inferno yet he is able to balance that with a comic book sensibility, the result is some of the most original images on the racks today. His ability to blend the horrific and the heroic is a perfect fit for the Inhuman characters who very often possess frightening facades. I can say enough good things about this guy I only hope that we get to see a lot more of his work and soon. I can only imagine what he could do on Swamp Thing or Batman at DC or Ghost Rider or Moon Knight here at Marvel. Keep your eyes on Ryan Lee I expect some pretty big things from this kid. Nolan Woodard’s muted hues are a super nice complement to Lee’s detailed renderings. His use of more subdued colors is a very smart balance to Lee’s hyper-detailed images however Woodard’s work is anything but toned down or washed out, he simply knows when to throttle back the vibrancy and when to punch it up for greatest effect. 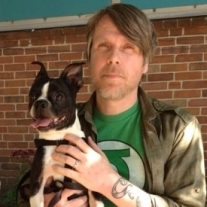 This entry was posted in Comic Book Reviews, Inhumans, marvel comics, shawn warner and tagged Inhumans, Jeff Loveness, marvel comics, Ryan Lee. Bookmark the permalink.